Copyright 2015 Unbounce Marketing Solutions Inc.
Start using your new podcast template in minutes. Creating a podcast is a lot of work – don't let that hard work to go to waste. A landing page can help you persuade potential listeners that they can't afford to not listen to your awesome podcast. Why would a podcast need a landing page? With over 250,000 podcasts on iTunes, you can't depend on the iTunes library to make your podcast stand out. With a dedicated landing page, you have additional real estate to explain the benefits of listening to your podcast – in the hopes of encouraging listeners to rate you and subscribe. So make them an offer they can't refuse. For added urgency, offer listeners a prize or content upgrade in exchange for an honest review. 1. Sign up for Unbounce — the first month's on us! 2. 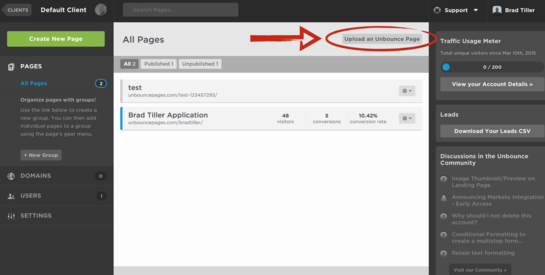 Log in to your account and select “Upload an Unbounce Page”. 3. Choose the podcast_template.unbounce file. Hit upload. Et voila! 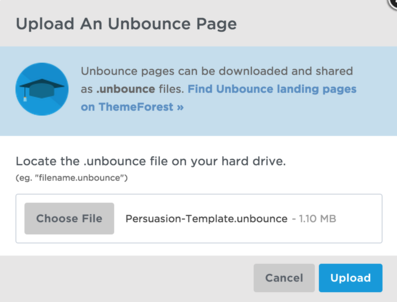 You'll need to access this page from a computer in order to download the .unbounce template file.